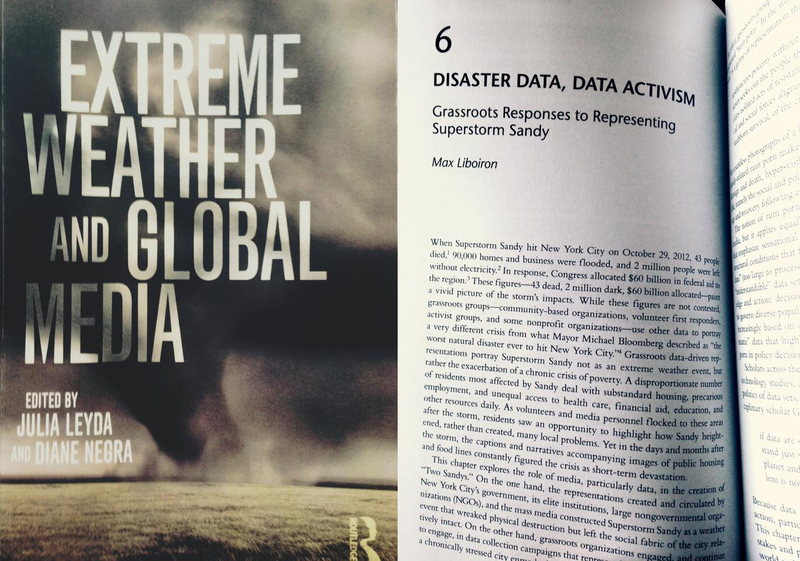 Based on her work with Superstorm Research Lab, SRL member Max Liboiron has published a chapter on “Disaster Data, Data Activism: Grassroots Responses to Representations of Superstorm Sandy” in an edited volume on Extreme Weather and Global Media. Abstract: Data played a central role in the creation of two different Hurricane Sandys in New York City. The data-based representations created by the municipal government, its elite institutions, and the mass media constructed Hurricane Sandy as a weather event that wreaked physical destruction. In response, grassroots organizations conducted data collection campaigns that represented Sandy not as an extreme weather event, but the exacerbation of a chronic crisis of poverty. Assumed to be objective representations, investigating the processes of creating disaster data demonstrates its inherent and even intentional politics of representation.